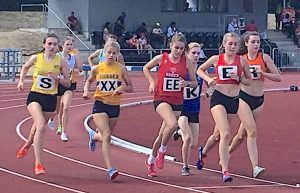 ATHLETICS: FIVE of Woking’s track and field athletes were flying the flag for Surrey at the Southern Under-17 Eight Counties Meeting at Lee Valley last Sunday. Izzy Leikis was the pick of the Woking scarlets at the Edmonton track, after she went on to win the high jump with a leap of 1.69m; a new personal best (pb) and grade one performance. It means that Leikis ranks in the top 8 in the country for her age. The Sheerwater-based athlete also equalled one of the oldest club records, which was set in 1973. At the same race meeting, George Hopkins achieved a new pb in the pole vault with a clearance of 3.95m, which is a grade two performance.